Victor has put our entire archive up on Comic Chameleon and defined panels for each comic! So click that link between the page and these comments, get the app, and you can relive the whole story on your iPhone with the greatest of ease. I’ve had a mental counter to count every time the God’s Symbols appeared. 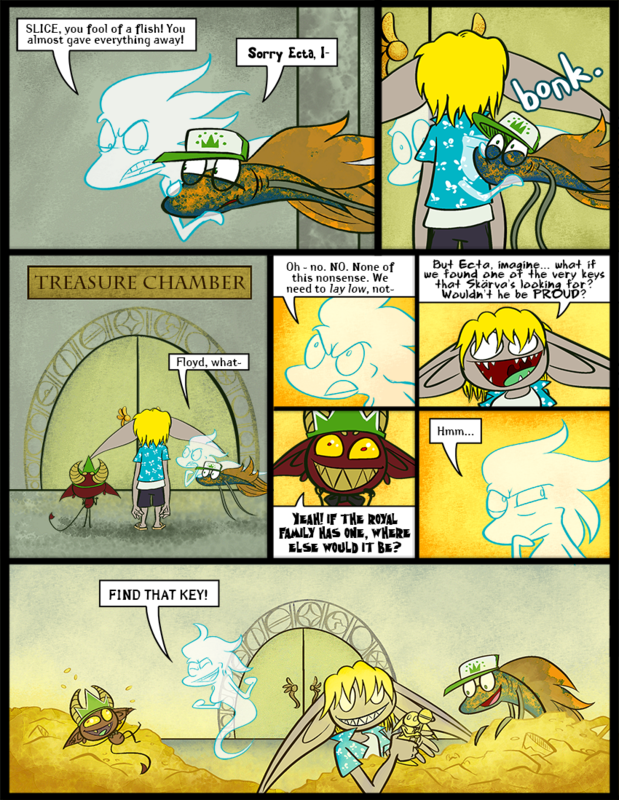 I wonder why they didn’t have to get a key to the treasure room door from some chest. The textures in this page are AMAZING. I quite love the art. And I can’t wait to see the comic on Comic Chameleon. Again, congratulations! They are not being very safe, you’re never supposed to touch something that glows of its own accord with your bare hands…. I love that Ecta can be selectively permeable. She can drag Slice WHILE moving through Floyd. I wonder what, if anything, that would feel like. Slices go “bonk.” all the time? And thanks to you, the Duck Tales theme is in my head, and will never leave. Lyrics I don’t know I just know minions! Woo-oo! Maybe that’s why Ecta looks so happy. Davis loves to dive around in it like a porpoise, burrow through it like a gopher, and toss it up and let it hit him on the head. That last panel contains the cutest Ecta yet! I’m going to tell myself that Ecta opened the door from the other side somewhere between panels and that it wasn’t just open. Besides, it would be a good reason they don’t let ghosts in the castle. Soooo, is this where they meet the soul of a thief who was bound by greed and turned into an idol? The one who sends them off to collect all of the *insert object here* to set him free, so that he might offer them a stupendous reward? Davis, that face is amazing!